With more activewear options to choose from than ever, the ones that really stand out from the rest of the pack are multifunctional. 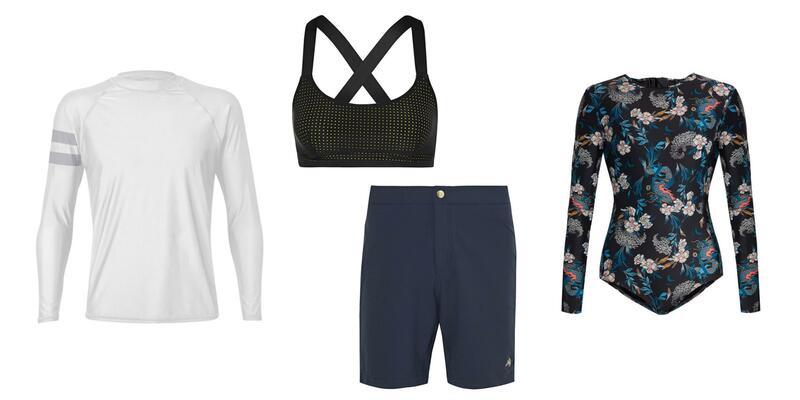 These smartly-designed pieces take you seamlessly from the gym to the water and back again. Your weekend escape bag just got a lot lighter. Sun protection (UPF 50) and style rolled into one neat little package, these leggings will keep you cool and comfortable on land or in the water. You might hesitate to wear sleeves during the hottest months of the year, but this high-tech topper is super breathable. It looks so slick you’d never expect it's perfect for riding waves and doing push-ups on the beach. Not only can you wear this bikini top in the gym as a sports bra, but it's also reversible: of-the-moment mesh on one side, sunny chartreuse solid on the other. Swim trunks, running shorts, and everyday-wear all in one item, these bottoms will be your go-to for every weekend away this season. Ideal for swimming in colder water, this one-piece is both functional and fashion-forward. In the gym, pair it with matching leggings from the same brand to get the full effect, or opt for a neutral solid bottom for something more subdued. This simple black top is made from such ultra-light, barely-there mesh that you'll want to wear it for every workout. Like much of Onzie's activewear collection, it’s completely water-safe, so you can seamlessly transition from a beach run to an ocean dip. Model and surfer Hanalei Reponty's swim and active collection is packed with pieces that can be worn for both sweating and swimming, including these hot yoga and beach-friendly short-shorts. Constructed from high-quality compression fabric, these will keep you feeling supported and secure through the toughest of workouts. Designed especially for switching between water workouts and land-based ones, these comfortable shorts feature a generous cut for ease of movement plus a performance mesh liner for more support than a traditional swimsuit.